The business sounds simple enough, and should be relatively easy to model. But, Wall Street plays their same old song and dance, and just applies trendline growth rates and margins to the current business to forecast what may happen in future years. That is the wrong way to go about estimating the future earnings of this company. A much more intuitive way is to look at the individual economics of a single (average) kiosk. This provides telling information about the health of the business and the underlying economic trends of the kiosks. Looked at through this lens, Coinstar’s Redbox business is currently hiding phenomenal and improving profitability. 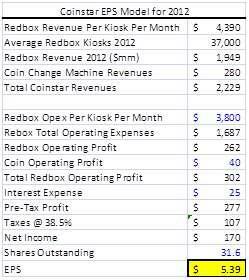 Since Coinstar breaks out the segment profitability of the Redbox business, we can do a deep-dive analysis of the individual kiosks. 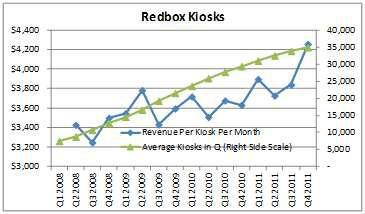 Shown below is a chart with the number of kiosks Redbox averaged in the quarter, along with the revenue per kiosk per month that they generated from the average kiosk. In the latest quarter, there was a price increase instituted, significantly propelling the revenue per kiosk per month higher. Our “average” revenue per kiosk per month numbers from the first chart show less growth because brand new kiosks, which are relatively under-used by consumers, drag the average down. As these kiosks are “discovered” and draw more repeat customers, they contribute more and more to the top and bottom lines. As new kiosks become a smaller portion of the total kiosks installed, the average revenue line should increase further. First, Q4  marked Redbox’s first holiday season with delayed titles. Based on our experience during the third quarter, we believe we had a solid indication of consumer rental patterns and expected stronger performance from the new 28-day delayed content during the fourth quarter. We purchased to this higher level of expected demand, and unfortunately many of these titles did not perform as we had anticipated. We are comfortable with the delayed deals we signed last year, and believe we can optimize inventory for these titles as we go forward. In summary, Redbox was working with “new” products and tried to provide the best consumer experience possible. They wanted to ensure sufficient inventory on the “new” product (28-delay content in Q4 2010 and games in Q4 2011) and they subsequently over-bought. 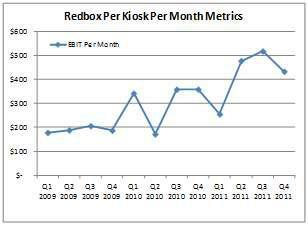 As seen below, at the end of Q4 2010, Redbox had $4,500 worth of movies in every kiosk, up from their typical $3,500. That greatly inflated their DVD costs in the next quarter. This makes sense, as the DVD Library Inventory is amortized (or used up) creating COGS in the subsequent one quarter, and sometimes two. As these “new” products mature, I believe Redbox’s DVD and game cost per kiosk per month should be rather steady. They have to contend with no agreement with Warner Brothers Studios that could inflate costs somewhat. However, I think they will be able to keep the full-year kiosk monthly content costs closer to $1,750 without any problem. What about other costs per kiosk? Other direct costs include rent paid to the host of the machine [Wal-Mart (WMT), Walgreen (WAG), etc. ], field employees to rebalance inventory amongst machines in a given locale, bandwidth to connect the kiosks to headquarters, and other miscellaneous expenses. There are also general overhead expenses and depreciation of the physical kiosk. As can be seen below, these expenses are incredibly stable on a per-kiosk basis. Intuitively, this makes sense. As grows its base of kiosks, it gains leverage on local managerial and labor costs, and it can strike better placement deals with large retailers. Moreover, its physical, fully automated kiosks, never demand a pay raise. *G&A and other direct costs estimated using wholeco figures for Q4 2011 as the 10-Q with segment breakdown was not available at the time of writing. 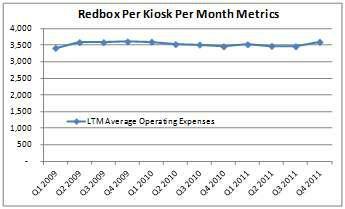 As should be pretty evident, Redbox’s total operating costs per kiosk are relatively fixed. In fact, this next chart shows total operating expenditures per month per kiosk on a trailing-12 month basis by quarters. 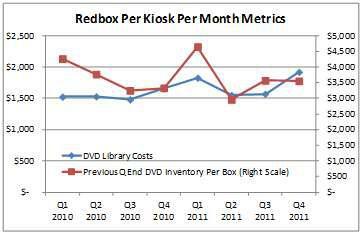 So, we have seen Redbox profitability increase greatly on a per kiosk basis over the last few years. But, what about recent events? Redbox recently instituted a 20% price increase on its standard definition DVDs (from $1.00 per night to $1.20 per night). Blu-Ray (7% of kiosk content) stayed at $1.50 per night, and games (4.6% of kiosk revenue) stayed at $2.00 per night. So, roughly 85% of their kiosk revenues increased in price by 20% on October 31st. 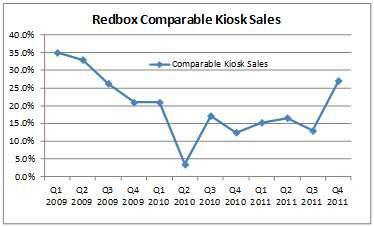 What does this mean for Redbox’s revenue per kiosk in 2012? It means it should go up significantly! But, by how much? This closely resembles Wall St. estimates of $2,170mm in revenues for 2012. As per the price increase, and the elasticity of demand, people are mistaken if they think the elasticity will be as great as that witnessed with Netflix. First, $1.20 vs. $1.00 is psychologically not that powerful. To the human mind, it’s only $.20. On the other hand, for someone on Netflix’s one DVD mail program who got free streaming, the new program saw costs go up roughly $8.00. That is a much harder pill to swallow and caused much more backlash than Redbox will ever likely see. I believe the Q4 2011 results of Redbox announced tonight (2/6/12) proved this point in spades. Looking at the graph below one more time, I can come to a quick conclusion on where EPS will likely be for Coinstar in 2012. It is almost certainly above $5.00. Just for giggles, Wall St. consensus is at $3.86 according to Yahoo! Finance. On 2/6/12, Coinstar gave guidance that they would likely earn $3.80 to $4.30 for 2012. I believe they are being incredibly conservative. After all, they estimated that in Q4 2011 they would earn $.57 to $.67 in the quarter. The $1.00 they actually earned is 50-75% greater than what they estimated. Maybe the >$5.00 number I see them earning isn’t so crazy after all! What Wall St. is missing is the massive operational leverage inherent in the Coinstar business model. 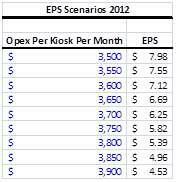 Every $100 per month in operating profit per kiosk is roughly $.86 of EPS. 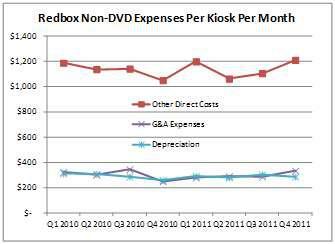 Redbox’s recent price increase will likely fall to the bottom line much more than people estimate. In addition, they have exciting new growth opportunities with their new ventures (they regularly shut down new venture trials so it is obvious that these tests have been exceeding high hurdle rates for return on capital). Next, their recent JV announcement with Verizon will likely give Redbox higher volumes as Verizon rolls out its digital strategy – Redbox said it would be contributing movie nights from its kiosks to the product offering from the JV. In summary, given that Coinstar is flexing its pricing power, still growing, has international opportunities ahead, and far from saturation, I would give it a market-like multiple of 15 on its $5.40 in likely 2012 EPS. That’s an $80 target for Coinstar.